Three of the most luminous supernova explosions ever observed could be the signatures of weird pseudo-stellar objects known as quark stars, according to a pair of scientists from the University of Calgary, Canada. The supernovae (dubbed SN2006gy, SN2005gj and SN2005ap) are 240 million, 864 million and 5,000 million light years away respectively. Each displayed luminosities 100 times over what should be expected, which perplexed astronomers as to the underlying mechanism when they were first spotted. Infrared (main image), visible (top right) and X-ray (bottom right) images show that SN2006gy, the brightest supernova ever observed, exceeded the brightness of its host galaxy. 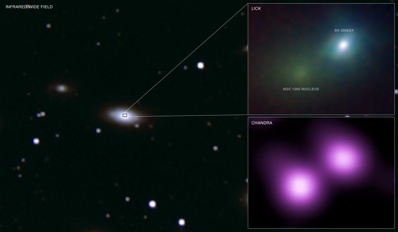 Image: NASA/CXC/M.Weiss/UC Berkeley/N.Smith et al/Lick/J.Bloom & C.Hansen. Drs Denis Leahy and Rachid Ouyed say that these objects were so luminous because they went supernova twice. They term this secondary release of energy a ‘quark nova’. That is, the conversion of a neutron star into a quark star. “The main reason that the second supernova is much more luminous is that the energy is deposited in the ejecta from the first supernova. In this way, much less energy is lost to expansion and much more is available for radiation (light),” says Leahy. The shock wave from the second explosion heats up the gas remnant of the first supernova (which is twice the size of our Solar System) and produces a bright and long-lived event. When a star several times the mass of our Sun uses up its fuel reserves, it explodes as a supernova. As well as blowing the outer layers of the star into space, there is a force directed inwards that compresses the core. Depending on the original star’s size, the core can be crushed into a neutron star, or a black hole. Neutron stars are incredibly dense: squeezing one and a half to three times the Sun’s mass into a sphere about twenty kilometres in diameter — small enough to fit inside inner London. A black hole is even denser and its gravity is so great that it warps the spacetime around it, so that not even light can escape. A quark star would be somewhere in between a neutron star and a black hole in terms of size and density. The idea is that quark stars are so dense that the neutrons have broken down into their constituent quarks, to form a sort of ‘subatomic stew’. But evidence for the existence of quark stars is scant and many astronomers remain sceptical. 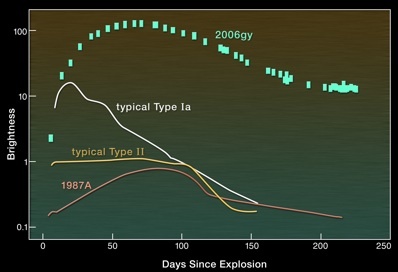 The peak luminosity of SN2006gy far exceeded that of a typical supernova. Image: NASA/CXC/UC Berkeley/N.Smith et al.. If quark stars do exist, Leahy estimates one out every 200 to 1000 neutron stars would be candidates.